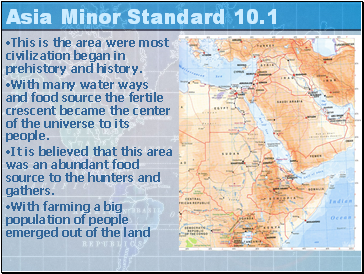 This is the area were most civilization began in prehistory and history. 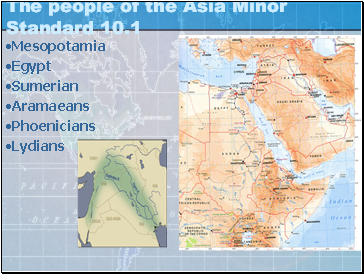 With many water ways and food source the fertile crescent became the center of the universe to its people. It is believed that this area was an abundant food source to the hunters and gathers. 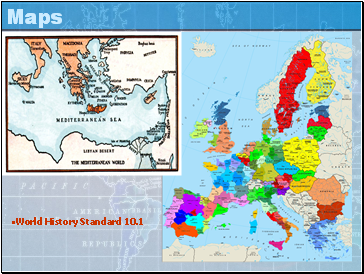 Both civilizations are known as the Aegean civilization which lived around the Mediterranean sea. 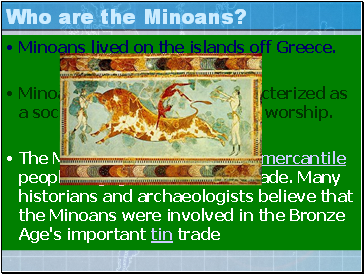 Minoans lived on the islands off Greece. Minoans culture is often characterized as a society centered on goddess worship. The Mycenaens lived on the main land. 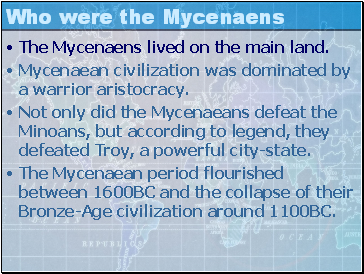 Mycenaean civilization was dominated by a warrior aristocracy. Not only did the Mycenaeans defeat the Minoans, but according to legend, they defeated Troy, a powerful city-state. The Mycenaean period flourished between 1600BC and the collapse of their Bronze-Age civilization around 1100BC. 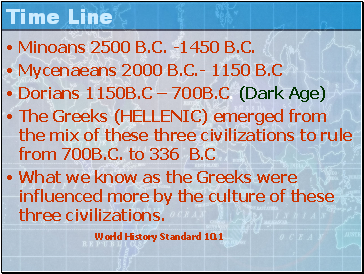 How the Greeks became a civilization. The Mycenaeans overtook the Minoans and the two merged. The Mycenaeans became powerful, but civil war weakened its strong fortresses and when invaders came they were easily overtaken. 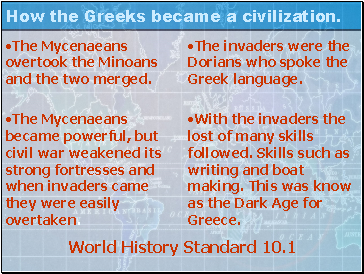 The invaders were the Dorians who spoke the Greek language. With the invaders the lost of many skills followed. Skills such as writing and boat making. This was know as the Dark Age for Greece. Minoans 2500 B.C. -1450 B.C.